Grab a bowl and get ready for our new comforting and cozy dish! 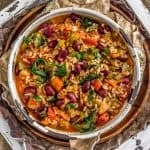 Easy to make and filled with aromatic spices and nourishing veggies, this Healthy Vegan Jambalaya is delicious soul food in a bowl. Tasty fire roasted tomatoes, green bell peppers, celery, carrots, garlic, and onions coupled with hearty kidney beans and rice makes for a soul-satisfying dinner that will have the whole family running to the dinner table. In a large ceramic/enamel-lined Dutch oven or similar stock pot, add the finely minced onion, green bell pepper, carrot and celery; sauté over medium heat until they begin to soften, approximately 7 to 9 minutes.Add a tablespoon or so of water if the veggies start to stick and/or to prevent burning. Add the minced garlic and sauté for 30 seconds, add the dry spices (smoked paprika, sweet paprika, onion powder, garlic powder, dried minced onion flakes, thyme, oregano, dill weed, cayenne pepper, sea salt and black pepper) except the bay leaf and sauté to release their fragrance, about 30 seconds to one minute. Then add the fire roasted petite diced tomatoes, veggie broth, water, and bay leaf, bring to boil, then immediately lower to a simmer. Stir well to incorporate all the ingredients. Cover with a tight-fitting lid and simmer for 15 minutes. After 15 minutes, add the kidney beans and liquid smoke, simmer for 5 more minutes, then discard the bay leaf. Test the flavors, add more spices, if necessary to achieve the level of flavor you desire. Add the cooked rice and baby spinach (optional) and cook for a few minutes. *Rice: Jambalaya traditionally has little to no broth; however, we really enjoyed having some broth, so we used less cooked rice. Since the rice is already cooked it is very easy to adjust the amount simply by adding more cooked rice to the dish. *Dried Crushed Thyme: We like to use dried crushed thyme leaves versus ground thyme. If you use ground thyme, use ½ of the amount indicated in the recipe. *Spices: The spices tend to mellow over the cooking process. Ramp up any spices as needed near the end of the cooking time to achieve the level of spice desired. We suggest starting on the low end for the cayenne pepper as certain brands pack more heat than others.